Annika Dahlsten and Markku Laakso are visual artists from Finland. Together they work with photography, media art and performance. 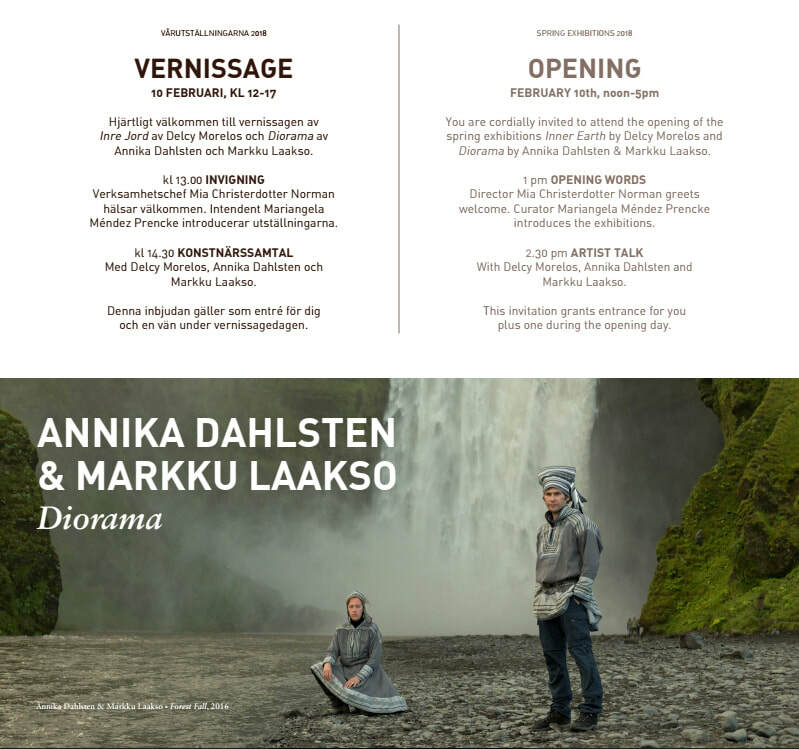 Dahlsten & Laakso have exhibited in various exhibitions and performed in festivals both in Finland and abroad. Annika studied art at Turku Arts Academy and graduated from printmaking (BA 2003) and animation (BA 2016). She also studied at Koninklijke Academie voor Schone Kunsten, Antwerp, Belgium (1997) and Turku university (BA 2008). Part of her artistic pursuit is teaching, curating exhibitions and writing about art. Born 1970 in Enontekiö, Hetta. Grew up in Koppelo, Inari. Markku studied art in Turku Arts Academy and graduated from painting department. He has been active in art organisatorial field in South West Finland region. Sámi heritage is a part of Markku's heritage. Defining the Sámi identity has been a long process and a journey to his own history and persona. Thus it is also an inevitable part of his art work. Annika Dahlsten & Markku Laakso: Etosha Pan, Namibia. 2013. C-print. 70 x 105 cm. the question of authenticity by asking who has the right to define what is authentic, who is real and when? and Southern Africa, including accidental passer-byes, humans and animals, in their pictures. questions of authenticity and origin. 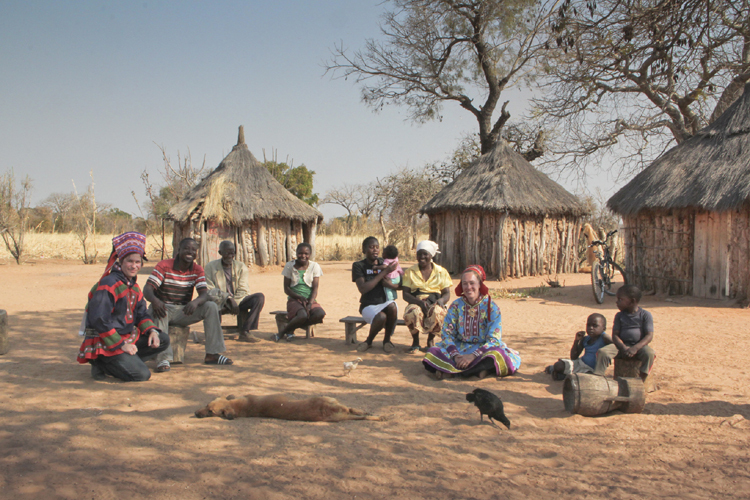 together with Sámi people in Germany, taking part in human exhibitions in various zoos. Die Ausstellung Sámi Contemporary zeigt vom 10. Juli bis 27. September im Felleshus, dem Gemeinschaftshaus der Nordischen Botschaften, aktuelle Arbeiten von 23 Künstlern aus Finnland, Norwegen und Schweden. Annika Dahlsten & Markku Laakso: Kalleyi's family. 2013. C-print. 70 x 105 cm. Kahdeksan erilaisista kulttuuritaustoista tulevaa taiteilijaa käsittelee menneisyyttä nykyhetken kautta. Taiteilijat rakentavat teoksissaan perheensä, sukunsa tai yhteisönsä perinnön uudelleen. Valokuvat, installaatiot, esineet, videot ja käsityöt kertovat, että perintö muuntuu ajan ja ympäristön vaikutuksesta. Se vaikuttaa yhtälailla nykyhetkeen ja tulevaisuuteen kuin menneeseenkin. Taiteilijat ovat: Annika Dahlsten ja Markku Laakso, Edwina Goldstone, Dzamil Kamanger, Bita Razavi, Jana Romanova ja Kukka-Maria Rosenlund. Kuraattori on Anna-Kaisa Rastenberger, Suomen Valokuvataiteen museon intendentti. Backlight Photo Festival 2014 continues the triennials tradition with focusing on social themes; relations between individuals, communities and societies. Backlight ´14 wants to provide thematically and functionally a platform for research and discussion about trust, and how trust and dependencies create tensions and shape cohesion in modern societies. Exhibitions Exhibitions are devided in three categories. Firstly Holding Cohesion -exhibitions are juryed from international open call. Exhibitions in Tampere and Valkeakoski are produced by Backlight main organizer. Artists Backlight ´14 represents 30 artists in main exhibitions: Backlight received 840 applications from 71 countries by international open call: 25 artists were selected all over the world. Additionally five artists were invited to Tampere Art Museum.